W6100 MKR-Ethernet Shield | WIZnet Co., Ltd.
W6100 Ethernet shield is designed using the WIZnet W6100 chip. Please click the link for the further information about W6100. The best advantage of the W6100 (MKR-)Ethernet Shield is that it supports IPv6. It supports both 3.3V & 5V. 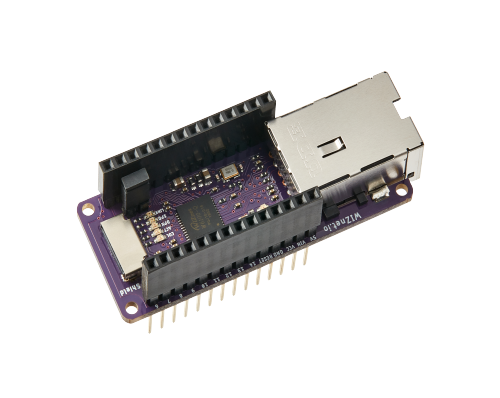 This Ethernet Shield is compatible with Arduino and ARM mbed Platform. W6100 suits users in need of stable Internet Connectivity best, using a single chip to implement TCP/IP Dual Stack, 10/100 Ethernet MAC and PHY. Hardwired TCP/IP Stack supports TCP, UDP, IPv4, IPv6, ICMP, ARP, IGMP, and PPPoE etc which has been proven through various Applications over many years.